Therefore there is usually a 24 hr delay before they appear. The 73rd Tankers Association has earned trust and respect while serving our Nation since 1948 fighting for what we believe in, even at the cost of our lives. The Association is dedicated to continuing the relationships developed by comrades that rubbed shoulders together in the service of our country as proud Men of Armor. The 73rd Tankers Association held it's 19th Reunion in Independence Mo. April 21-25 2015. The Association has 300 members listed on the roll 15 members were present. The oldest was Curtis Banker, founder of the 73rd T. A., he still has the hand shake of a bear. Many stories were shared and I'm honored to be the newest member of the Association. I now know the story of how Fort Beavers received it's name form the men that were present that fateful day. 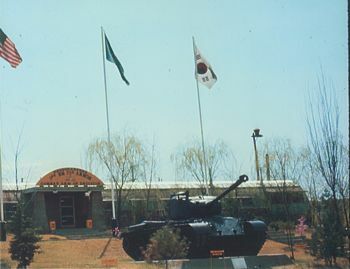 The 20th Reunion is being planned to be held at Fort Benning Ga. where the tanker's started out training and preparing for the battles of Korea which lay ahead of them. 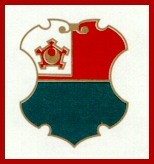 The Association is open to any former or active soldier who has served under it's motto of HONOR, FIDELITY, COURAGE. These aging Combat Vets would love to see their 73rd Tankers Association carried on in history by the younger vets that served under its Colors with the 82nd Airborne Division. Tim Jackman on a recent visit to Ft Bragg found the 73rd Armor is now the 73rd Cavalry Regiment. 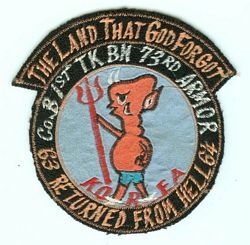 He didn't find the unit on post but there were Unit crests, decals and embroidered patches available. 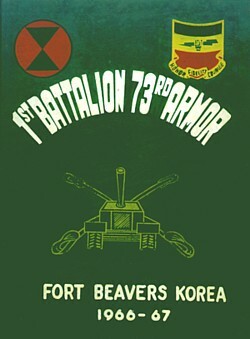 Lewis Witt has visited the old Fort Beavers site in September 2013, which is now occupied by the ROK Army 38th Tank Battalion, 26th Mech Division. Share his story and pictures by going to the 1963-1964 tab. 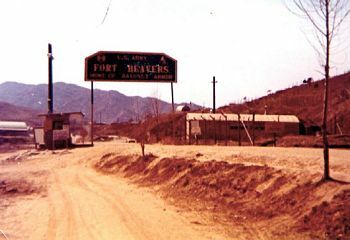 FortBeavers.com is always looking for pictures, movies, video, stories and additional information on Fort Beavers, if you have any, and would like to share, please contact me with your info. It is the veteran...not the preacher...who gives us freedom of religion. It is the veteran...not the reporter...who gives us freedom of the press. It is the veteran...not the poet...who gives us freedom of speech. It is the veteran...not the campus organizer...who gives us the freedom to assemble. It is the veteran...not the lawyer...who gives us the right to a fair trial. It is the veteran...not the politician...who gives us the right to vote. And it is the veteran who salutes the flag...who serves under the flag...and whose coffin is draped by the flag.